Despite all his disaster planning, and the bomb shelter he built under his shed, Mario Scietto was not prepared for the apocalypse that hit Monument, Colorado. A series of escalating disasters, beginning with a monster hailstorm and ending with a terrible chemical weapons spill that affects people differently depending on blood type, has torn the world as he knows it apart. 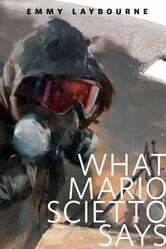 "What Mario Says" is set in the world of Emmy Laybourne's Monument 14. The final book in the series, Monument 14: Savage Drift, goes on sale May 6th. This short story was acquired and edited for Tor.com by Feiwel & Friends editor Holly West.